Following the success of the bestselling Multiple Streams of Income, Multiple Streams of Internet Income took the idea of making money on the Internet to the next level, by revealing how to deliver a marketing message faster, cheaper, and to a larger number of potential customers. This new updated edition includes the same wisdom that made Allen one of the most influential financial advisors in the world, but also features updated information on everything readers need to know. 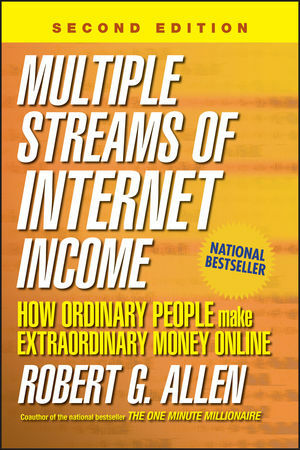 The book features the original seven powerful methods that average people can use to make money on the Internet, and covers such topics as taking offline products online, niche marketing, successful Web-based business models, information marketing, affiliate programs, and more. There's plenty of new material in this Second Edition, including coverage of new federal and state laws covering spam and how to work around much of the new anti-spam technology active on the Internet. All the Web sites and online resources featured in the book have also been updated. ROBERT G. ALLEN is an entre-preneur and the successful author of Nothing Down, the largest-selling real estate investment book in history; the #1 New York Times bestseller Creating Wealth; and the national bestseller Multiple Streams of Income (Wiley). He is also the coauthor (with Mark Victor Hansen) of the national bestseller The One Minute Millionaire and Cracking the Millionaire Code. Introducton: Online Success: Money While You Sleep. Chapter 1. Show Me the Money: How to Earn $24,000 in 24 Hours. Chapter 2. Crossing the Digital Divide: How to Guarantee Your Success on the Internet. Chapter 3. Internet Marketing 101: A Few Simple Strategies Can Make Your Rich. Chapter 4. Internet Marketing 201: 12 Powerful Principals for Creating a Feeding Frenzy. Chapter 5. Internet Marketing 301: Going Deep—The Secret to Online Streams of Income. Chapter 6. Netpreneurs, Start Your Search Engines! Six Powerful Ways to Drive Traffic to Your Site. Chapter 7. Online Mar-Ka-Ching! Six Major Ways to Make Money from Your Site. Chapter 8. Beyond Stickiness: Nine Magnetic Ways to Keep 'em Coming Back for More. Chapter 9. Ready. Set. Launch. How Fast Can You Go From Zero to Cash? Chapter 10. Online Stream #1. Joint Ventures: High-Leverage Ways to Make a Fortune Online. Chapter 11. Online Stream #2. Affiliate Programs: Cash In by Selling Other People's Stuff. Chapter 12. Online Stream #3. Selling Information: Turn Your Ideas into Steady Streams of Cashflow. Chapter 13. Online Stream #4. Eyeballs for Sale: Making Advertising Pay. Chapter 14. Online Stream #5. Picks and Shovels: Making Money From the Infrastructure of the Net. Chapter 15. Online Stream #6. Treasure Hunting: Turning Junk into Cash with Auctions. Chapter 16. Automatic Pilot: Making Money 24/7/365.